Imagine going to work every day to do only and exactly what you love!! All the work gets done because of the abundant diversity of your team. Different skills, interests and talents are woven together into a whole that is much greater than the sum of the parts! For too many people, doing work they love is only a dream. Frustration, craziness, drama, apathy and dealing with controlling bosses all contribute to toxic and disengaging work environments, making them dread Mondays and live for the weekends. 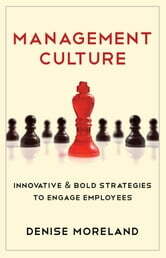 In Management Culture: Innovative & Bold Strategies to Engage Employees, author Denise Moreland analyzes what is wrong at work by focusing on management culturethe common beliefs, language, expectations and pressures placed on managers to behave toward employees in ways that are destructive, counter-productive and disengaging. Ms. Moreland offers a new vision of engagement based on employee strengths and passions. 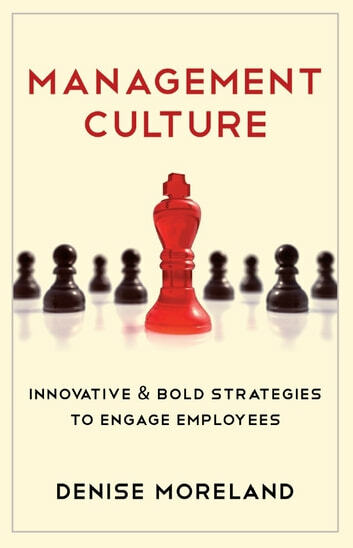 She offers practical advice on how to create a healthy work culture where employees look forward to going to work. Imagine a workplace where leaders lead with integrity, honesty, and transparency, setting directions that make sense and making decisions that are broadly supported. Imagine employees trusting management and management trusting employees. Imagine everyone doing only and exactly what each loves, and all the work gets done! Imagine it and make it true! Not the most fun book I ever read but the best I could find for to the point advice on how to behave as a competent manager. This will either confirm you're on the right track or raise flags that you're likely driving the people who work for you crazy.